Will Chipotle’s New Queso End Up as a Failure? Despite being one of the most hyped new foods in recent fast food memory, Chipotle's new queso has been met with a lukewarm reception since the chain unleashed it nationwide on September 12. Customers on Twitter have pilloried the all-natural cheese dip, heaping scorn on Chipotle in an internet pile-on that's lasted all week. and now, even Wall Street analysts are jumping in, noting that queso will likely prove to be a financial disappointment for the burrito juggernaut. "A very negative reaction to the queso launch suggests Chipotle launched a product that is not meeting consumer expectations, and, as a result, missed a potentially significant opportunity to add queso as an incremental add-on." Queso's very unheralded debut demonstrates that "few customers will become repeat consumers," of the dip, according to the analysts. Still, Chipotle is doubling down on its efforts to make queso a beloved fixture of its menu, despite its rocky start. In fact, spokesperson Chris Arnold said on Monday that the company is eliminating chorizo from its restaurants, in part to focus on the gooey, new sauce. Queso was projected to be a fan favorite, given that Chipotle fans clamored for the chain to bring the sauce to its menu for years. But the seemingly rough introduction has left Chipotle's financial situation looking a little bleaker than usual. CNN reported the company's stock fell by 3.6% on Monday and by another 1.5% on Tuesday. 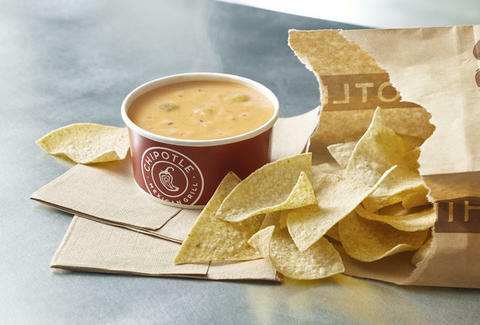 For it’s part, Chipotle points to its queso’s simple, additive-free recipe in response to complaints from customers. Unlike most of the delicious cheese dips currently on the market, the company painstakingly developed a queso that fits its strict requirements for all-natural food. The queso includes only 23 ingredients, all of which you can actually pronounce. However, the overall flavor and texture appears to be tripping up those looking to douse their burrito bowls in the melty cheese. While the minor queso crisis won't do the kind of damage wrought by a string of major E. Coli outbreaks that tarnished the restaurant's reputation in 2015, one thing certainly is clear: Chipotle's road to recovery may not be paved with cheese after all.